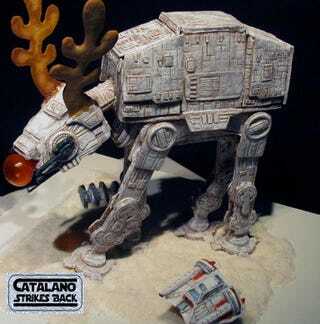 If it weren't so adorable with that candied nose and cookie antlers, this gingerbread AT-AT Walker would look ready to storm the sugary plains of Hoth. Chef Aaron Lawrence of Victoria, British Columbia's Catalano Restaurant and Cicchetti Bar created this edible delight for Canada's National Gingerbread Showcase. It's a shame that such a majestic delight can be taken down by mere gummy bears.